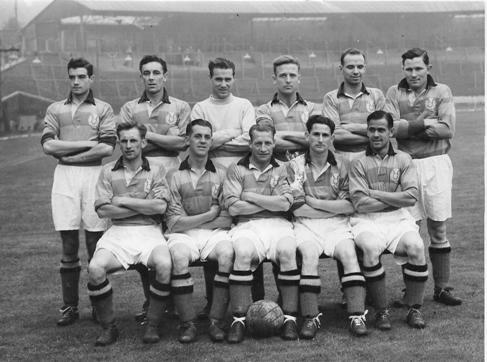 A team goup photograph from the 1952-53 season has recently been discovered and sent to the football club by Graham H. McCallum. Thanks to Tommy Taylor and Ami Small for sending the photo to me. Partick Thistle team group 1952. Back row (left to right): Crawford, Davidson, Ledgerwood, Gibb, Mathers, Stott. Front row: McCallum, Howitt, McGowan, Sharp, Walker. The photograph was previously unknown and a team photo from this season wasn’t included in the 2002 Official History. The picture was taken prior to the Leage up tie against Hibs in August 1952. Have you ever seen an image of a Jack Foulds who later played for Barnsley please ? I’ve got no record of a Jack Foulds playing for Thistle I’m afraid, so no image either. Sorry. I was looking at an 1888 PT match report from the Herald and googled Inchview to see if I could locate it in modern Glasgow (as part of dissertation research – MA at DMU in the history of sport – on the language of football circa 1888) and came across your site. Just want to congratulate you. Magnificent job. You can see the 2002 history at the Mitchell Library. However, there’s no record of a John Whyte playing in the first team in 1954-55 season. However, you might contact Stuart Deans – stuthejag at hotmail.com – he has better reserve team records than I do. Hi, could you please give me any information that you may have on Alex Stott – specifically – the seasons he was with Thistle? I’m compiling a book from the clippings his family have kept which are all in a bit of a mess. I don’t have much on Alex Stott. 119 appearances and 79 goals is a fantastic goals to games ratio. He joined Thistle from Dundee in November 1949 and became first choice centre-forward that season. He left the club at the end of the 1952-53 season.